There were two carrots walking down the road, a big carrot and a little carrot. On the other side of the road they see their friend cabbage in his cabbage patch. Big carrot says: "Let's go visit cabbage on the other side of the road." Little carrot says: "But there is so much traffic here I'm afraid I might get run over." Big carrot says: "Nonsense, just wait for a break in the traffic and run as fast as you can." Big carrot sees a break in the traffic and runs over to cabbage. He then calls to is friend to try. Little carrot gets ready, sees a break in the traffic and runs across the road. Unfortunately there was a big truck coming and little carrot gets squashed in the middle of the road. Big carrot feels really bad and scoops his friend up and takes him to the hospital. The doctors perform emergency surgery. After several hours the doctor comes out. "I have some good news and some bad news." Big carrot says: "Ok doc, go ahead, I can take it." The doctor says, "Well the good news is that your friend is going to live, but the bad news is he's going to be a vegetable for the rest of his life." "Take only one apple please - God is watching." "Take all the cookies you want - God is watching the apples." A woman hosted a dinner party for people from work and everyone was encouraged to bring their children. All during the sit-down dinner one co-worker's three-year-old girl stared at the man sitting across from her. The girl could hardly eat her food from staring. The man checked his tie, felt his face for food, patted his hair in place, but nothing stopped her from staring at him. He tried his best to just ignore her but finally it was too much for him. He asked her, "Why are you staring at me?" The little girl said, "I just want to see how you drink like a fish!" A woman goes to the post office to buy stamps for her Christmas cards. She says to the clerk, "May I have 50 Christmas stamps?" First Farmer: Did the tornado damage your barn last night? Second Farmer: Don't Know. Haven't seen it yet. First Farmer: My brother bought a farm that's an inch wide and a mile long? Second Farmer: What can he grow on a farm like that? First Farmer: Spaghetti, I guess. First Farmer: What would you do if a bull charged? Second Farmer: I'd give him all the time he wanted to pay off the bill. First Farmer: How do you tell the weeds from the valuable plants? Second Farmer: If it pulls out easily, it's a valuable plant. Our nation's Big 3 auto manufacturers face bankruptcy. We must go back to the old time basics. 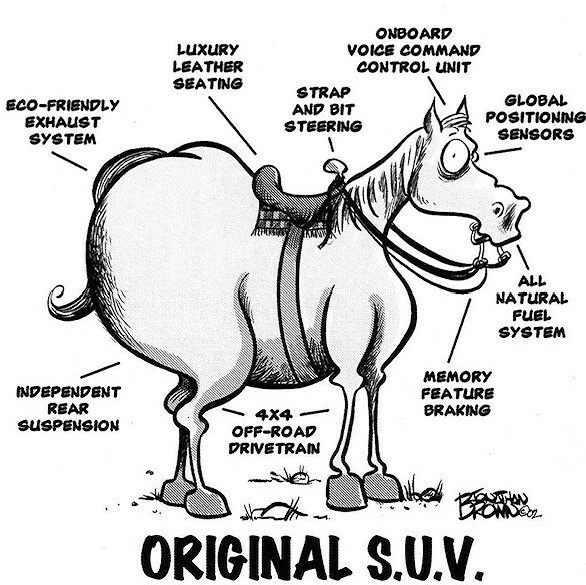 Americans will soon need to embrace the original SUV. Quarter horse mare. Well bread. Free pick-up and delivery. Try us once, you'll never go anywhere again. And now, the Superstore-unequaled in size, unmatched in variety, unrivaled inconvenience. The farmer from Texas was traveling through Vermont and stopped to talk to a local farmer. "How large of an acreage do you cultivate?" the Texan asked. "Oh, it's pretty big," the Vermonter replyed. "My farm extends for about a hundred yards in that direction and for nearly a hundred-twenty yards in that. And how large an acreage do you handle?" "Back home," he said, "I have a ranch with my house located at one end. I can get into my truck at the house in the morning, turn the ignition key, step on the gas, and by the end of the day I still won't have reached the other end." The Vermont farmer nodded sympathetically. "Yeah, that's tough. I once had a truck like that, too." pulling, he wouldn't even try!" Modem: What you did to the hay field and ditches. Keyboard: Where you hang the keys when you finish work. Windows: What you shut when cold weather sets in. Windows 98: Temperature at which you must have them open. Log On: What you put on the stove after you shut windows. Mouse: A rodent found in the barn. Hard Drive: Traveling during a blizzard. Download: Getting firewood off the pick-up. Megahertz: What you'll have if you're not careful downloading. Floppy Disk: An indication that your machinery needs repair. Microchips: What your calves leave in the pasture. Computer: What you say when you call your hound "Puter". Byte: What Puter does if you don't feed him when you call. An old country farmer with serious financial problems bought a mule from another old farmer for $100, who agreed to deliver the mule the next day. However, the next day he drove up and said, Sorry, but I have some bad news: "The mule died." "Well, then, just give me my money back." "Can't do that. I went and spent it already." "OK, then. Just unload the mule." "What ya gonna do with a dead mule?" "You can't raffle off a dead mule!" "Sure I can. I just won't tell anybody he's dead." A month later the two met up and the farmer who sold the mule asked, "Whatever happened with that dead mule?" tickets at $2 each and made a profit of $898." "Just the guy who won. So I gave him his two dollars back." The following Cattle / Cow Sounds Are Hilarious. To hear them, simply click on the links below.